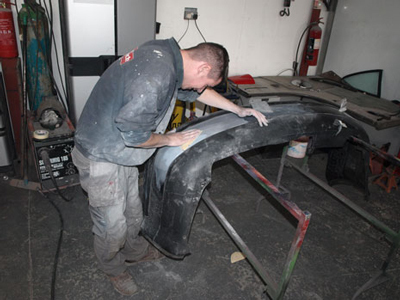 Our bodywork repair facility is housed in a newly built premises and boasts a fully equipped body shop and spray booth with all the modern tools and machinery. This enables us to carry out repairs to your vehicle to the highest quality standards available. In order to keep up with the changes in car body materials, we have invested heavily in new equipment like our single and double spot welders. These give us the capability to work on any car regardless of the type of steel used in the bodywork. We have also installed a new water based spray booth which enables us to offer two different paint systems so you can be sure that you are getting nothing but the highest quality finish for your paint work as well as getting the most precise colour match for your vehicles colour scheme. So wheteher its a small scratch, a full respray or heavy bodywork damage, Auto Tech Body Repairs is your one-stop-shop for a professional repair service which will restore your vehicle back to its pre-accident condition.